Central Americans forced to flee devastating violence in Honduras, Guatemala, and El Salvador are re-victimised along the migration route to the United States and Mexico, according to a report released today by Médecins Sans Frontieres/Doctors Without Borders (MSF). These populations lack comprehensive access to medical care, and are forced to contend with more violence along the route and aggressive deportation policies that disregard their need for assistance and protection. “The unrelenting violence and emotional suffering endured by a significant number of people on the move from the Northern Triangle of Central America (NCTA), is not unlike what is experienced by people in the conflict zones where we have been working for decades,” said Bertrand Rossier, MSF’s Head of Mission in Mexico. Today´s report, “Forced to Flee from the Northern Triangle of Central America, a Neglected Humanitarian Crisis”, examines medical data, patient surveys and testimonies gathered by MSF teams during two years of direct medical attention. The report illustrates the extreme level of violence experienced by people fleeing the NCTA, and the need for greater care and protection of people along migration and refugee route. Of the 467 people interviewed by MSF, 39.2 percent mentioned direct attacks or threats to themselves or their families, and extortion or gang-forced recruitment as the main reasons for fleeing their countries. Additionally, 68.3 percent reported being victims of violence during their transit in Mexico. In total, 92.2 percent of migrants and refugees seen by MSF mental health teams in 2015 and 2016 had lived through a violent event in their country of origin or during the route. Furthermore, MSF’s report shows that access to comprehensive health care, treatment for sexual violence and mental health services along the journey is limited or non-existent. An MSF psychologist embracing a minor who emigrated from the Northern Triangle of Central America. “It’s the fourth time that I've tried to cross through Mexico, but this had never happened before”, a 35 year-old lady from Honduras told MSF. “This time, I came with my neighbour, and we were both held captive by a group of delinquents. "The worst part is that they were Hondurans too. The federal police were their accomplices, and each one of us was handed over to gang members. Government strategies have "devastating consequences"
Despite facing some of the worst violence in the world today, migrants and refugees from the NTCA region are still mostly treated as economic migrants by countries of refuge such as Mexico or the United States. People forced to flee violence from the NTCA have limited access to asylum status in the US and Mexico, despite the existing needs and legal framework. “While there are certainly people leaving these countries for better economic opportunities, the picture that emerges from our report is one of terrorised vulnerable people running for their lives and those of their families” said Bertrand Rossier. “Attempts to stem migration by strengthening national borders and increased detention or deportation, as we have seen in Mexico and in the US, ignore a genuine humanitarian crisis and do not curb smuggling and trafficking. MSF calls on governments across the region—mainly El Salvador, Guatemala, Honduras, Mexico, Canada and the US – to ensure better alternatives to detention and adherence to the principle of non-refoulement. These countries should increase their formal resettlement and family reunification quotas, so that people from the NTCA in need of international protection, including asylum, can stop risking their lives and health. 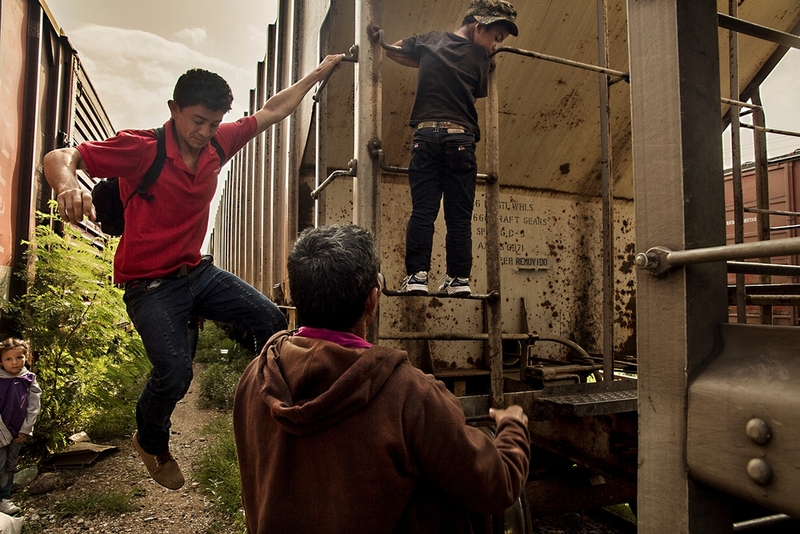 Many migrants travel on a cargo train, known as The Beast. They often suffer robberies and sustain injuries on the way. “The plight of people on the move from NTCA shows a failure of governments to provide assistance and protectio to migrants and refugees," said Rossier. “To play on public fears and merely view these people as a security or an economic issue is short-sighted. Since 2012, MSF has been providing medical and mental healthcare in Mexico to migrants and refugees fleeing Honduras, Guatemala and El Salvador. We have been adapting our intervention strategy from working in migrant shelters, and with mobile clinics alongside the railway tracks at various locations along Mexico’s migration and refugees routes, to setting up a centre for victims of extreme violence in Mexico City. The centre opened in 2016 as a last strategy to respond to the humanitarian and medical needs of people on the move.